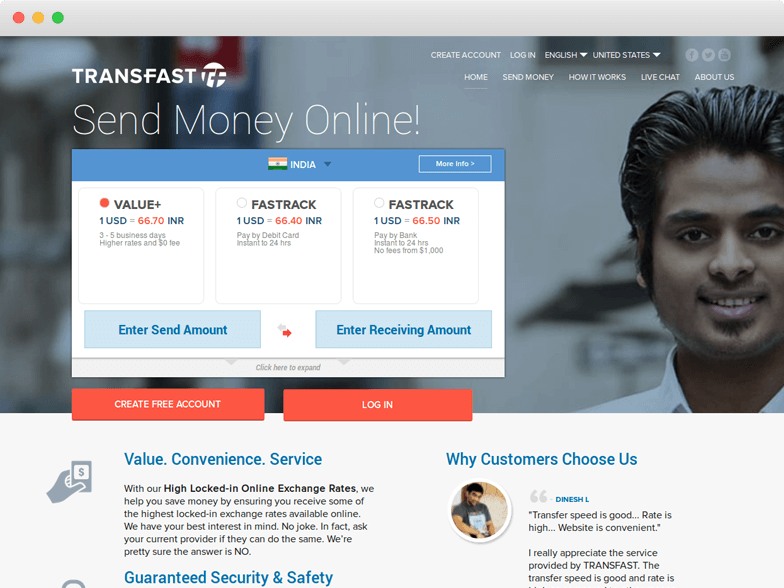 All the useful information that you need to know before sending money with Transfast! Transfast, a New York based service of parent company WyndPay is in business for 29 years and with it’s A+ rating on BBB it has more than 7 million customers trusting its services. Transfast provides comparable exchange rates for service fee between 0 and 7.99 USD. It offers remittance from US and Canada to 50+ countries with payout option of bank deposit, cash pickup and more. Where available use it’s Value+ product to get best rate and use Fastrack to get instant delivery. Just like its services are available 24/7 over website and mobile apps it has 24/7 customer support via email, phone and chat. It employs best in class security so stay worry free about your personal data. Overall we rate Transfast 8 out of 10. Pricing : How much does Transfast cost? Transfast sets its money transfer rate once a day. The rate offered to you when you begin transaction is locked in until transfer is complete. Exchange Rates offered by Transfast are comparable to other remittance service providers. Fees charged by Transfast for money transfer services range from absolutely nothing (FREE) to 7.99 USD. Fee is charged based on option you choose like country you are sending to, how you want recipient to receive money, if you are using bank account or credit card, speed you are expecting etc. Cheapest option is Value+ service for free and most expensive one is Fastrack service for 7.99 USD (see transfer speed review for details on these services). Even though Transfast offers free transfers to most popular corridors other corridors are charged flat fee of 4.99 USD. Transparency: Does Transfast have any hidden fees? Transfast is very transparent on its exchange rates and fees. your exchange rate is locked in once you begin the transaction and are good until funds are released to recipient. Fees transfast charges is clearly shown on transaction and is updated with every option you choose. The total amount you see on your transaction is what you pay, not a penny more. When it comes to transparency on transfer speed Transfast has opportunity to improve. Even though transaction shows how long it may take for funds to be released it does not show if transaction has flags which could delay the processing. But one should note Transfast do provide email and SMS alerts for transaction tracking. Transfer Speed: How long does it take to send money through Transfast? Transfast has variable transfer speed. For qualified transaction funds can be released in few minutes. But to get fastest delivery you have to have your and your bank information validated before hand. Your first transaction may take 3 -5 days, but once sender and receiver validated your transaction can be cleared in a day or less. Many users on review sites complain about Transfast speed but one must know as with any financial institution in US and Canada Transfast is bound by laws to prevent fraud and funding for illegal activities. For this reason some transactions could be placed on hold for manual review. Having at least one traction completed between sender and receiver with Transfast helps fast delivery when in rush. Transfast transfer speed is also dependent on how fund is released to recipient. With bank deposit option funds could be released to many banks instantly, if not instantly most bank deposits happen in few hours. Security : Is Transfast Safe? Security and data privacy are two of the most important factors consumer is worried about in this cyber age. Transfast secures your data by using industry standard SHA2 256 bit encryption technology. Transfast uses Norton security certificates, most trusted security certificate provider. Transfast claims to have physical security equivalent to banks and security practices are monitored and verified by TRUSTe and VeriSign. Transfast has a 24/7 Built-in Transactions Monitoring, if transaction triggers fraud alert a transaction gets placed on hold until Transfast agent verifies transaction with customer over phone or through email. They also ensure customer is using their own account on which they have authority to transfer funds. We believe with physical and digital security controls equivalent to banks Transfast deserves 10 out of 10 for this category. Transfast is available to customers through its pretty responsive website. You enter the recipient country and amount to remit and exchange rate is presented to you with zero clicks. User sign up is pretty easy too. Transfast offers it’s customer Android and iOS apps as well (please check links at the bottom of this review). One thing I didn’t like on mobile apps is one has to sign in before using or just checking exchange rates on mobile apps (you don’t have to do that on Exchange Rate IQ’s Android App and an iOS App). Transfast website as well as mobile apps allow you to add funding account details instantly with what they call ‘Instant Add’. This feature allows you to login to your bank account and Transfast will pull required details. When it comes to customer satisfaction Transfast has 24/7 Customer Support via phone, email and chat to address your concerns. Transfast also provides 100% money back guarantee if transaction doesn’t go through. It also has email and SMS alerts for transaction tracking. About payment convenience Transfast accepts payments from Checking accounts, Visa or MasterCard Debit/Credit cards. Sorry Savings and Money Market account holders, American Express and Discovery card holders as well as crypto currency holders, these are not accepted by Transfast. Bank deposit and cash pickup are it’s widely popular payout options. But for it’s Philippines customers Transfast also offer home / office delivery, cash cards and bill payments. For user experience we rate Transfast 8 out of 10. We would have given Transfast higher score only if it’s customer had clear insight in its transaction hold and review process. Coverage: How many Countries & Currencies does Transfast support? With Transfast one can transfer money from US and Canada to 50+ countries in Americas, Asia, Africa, Europe and Australia. Transfast is licensed to operate in 37 states in US and 7 provinces in Canada. Even though Transfast offers money transfer on world’s leading corridor it still has plenty of opportunity to grow. As United Kingdom, Saudi Arabia and United Arab Emirates are among top outbound remittance countries large customer base is left out on Transfast. Transfast also allows transferring money to charity in select countries but there is no clarity which charities and countries transfer is permitted. I initiated the transfer with them and they initially mentioned that it will take 5 business days, but even after 5 business days, there was no transfer and they asked me to send the documents again, which I already uploaded on their portal earlier, I still tries to upload the documents but there is freaking error that upload failing and cannot upload documents, on informing the same to customer service agent, they said they can't do anything, and they cancelled the transaction. Now even after cancelling the transaction, I am still waiting for more than a week for the amount to be refunded, not sure how they can play with someone's hard earned money. This is totally waste of time as money does not reached back home on time, and all because of their pathetic service and failed to deliver what they guaranteed. Now I am still waiting for the amount to be refunded. My transaction number: 33TF191006213 Here is how they are making money; every time you make a transaction they earn interest first by taking 3-5 business days to deposit and then they cancel your transaction and take another 6-7 business days to refund. Imagine millions of dollars and their fees. They Didn't give me a full refund worst service. FRAUD stay away. You can see now after 14 days they are saying they will refund the money. I provided all information and multiple phone numbers.And as everybody knows all information must be provided BEFORE money is sent. I have written multiple emails and reviews (see below) and always an automated letter with a false statement. They are just incompetent crooks. It is a huge risk to send money with Transfast. Now we will see how fast they refund the money they stole from me and held for weeks. Do not make any transfers with Transfast there are plenty of reliable honest companies like World-Remit and Transferwise. They say i didnot pass their initial verification still they charged my account. while other services take half-hour to one day for refunds they said it will appear in my account again in 5- 7 days. It's already on my posted transaction. Don't use this service. Customer service is very bad. Trustable and on time when you use their fast track service!! Rates are competitive as well. I was referred to Transfast by an Aunt, and I’m just mad she didn’t tell me about them earlier. The rates are good, the transfer times are quick. Done quite a number of transfers to them and sometimes, it was a matter of hours or even less than an hour for the money to show up in Nigeria. Their customer care are also very responsive without sacrificing security. I’ll recommend them to anyone trying to send money to Africa. My experience with transfast is been very quick and efficient. My first time I sent money, I chose the wrong plan. But now I don't have any problems with their services. Very reliable and very efficient service. I'd refer my friends and family. Thank you for your service. Excellent service at reasonable prices, you can depend upon TransFast to do it right every time!!! Transfast gives the best rate consistently. There is no transfer fee or hidden fees. The transfer takes more time than all other services known to me, but I can wait for getting a better rate. Adding recipients and funding sources is also very easy and the website is easy to navigate too. I love Transfast and use their service as much as possible. There is also QUICK SEND option with which you will be brought to a review screen where you can edit details pulled from your previous transaction and hitting SEND NOW submits the transaction.